The reason why the Polymeric Asphalt Slurry GeoFlo and the Percol Polymers (i.e. Alligator Glue, Elastic Cement AC) work better than conventional repairs is that they are 100% polymer. Current Asphalt formulations generally have a binder which holds the aggregates in suspension but allow for some movement unlike a more rigid concrete pavement which does not allow for movement at all. The binder can contain SOME Polymer but generally never more than 4 or 5% at most. GeoFlo is 100% polymer and does a better job maintaining the aggregates in suspension as it doesn't loosen its grip on the aggregates when under pressure and protects the aggregates from breaking out of the emulsion binder. GeoFlo, and Percol Polymers (i.e. Alligator Glue, Elastic Cement AC), unlike conventional asphalt, is impervious to future moisture penetration, along with Hydraulic Fluid, Brake Fluid, Diesel, Jet Fuel, Gasoline, Various Acids, or any other compound that can break down the emulsion binder and allow it to release its grip on the aggregates, avoiding subsequent pothole, birdbath or alligator formation. It's low viscosity makes for a self leveling repair so you don't see the traditional skin patch bump, making for smoother, seamless, load transfer with a full load of traffic. By only restoring structure where it is absent, you do not need to do any demolition or removal of the asphalt which cuts down on the volume of repair material required. It's formulation makes for a bond that is far superior to a traditional asphalt bond without the requirement of heavy compaction and the heavy equipment required to get that compaction. 1202 PERCOL Alligator Glue is a hand mixed version of Elastic Cement AC and are supplied in convenient six packs (3 half gallons each of "A" and "B"). Combined with aggregates, it forms a high performance, quick setting, flexible polymer concrete. Within an hour of placement, durable repairs are ready for traffic. Withstands vibration, heavy traffic loads, and thermal movement. Available in Black. For repair of Asphalt. 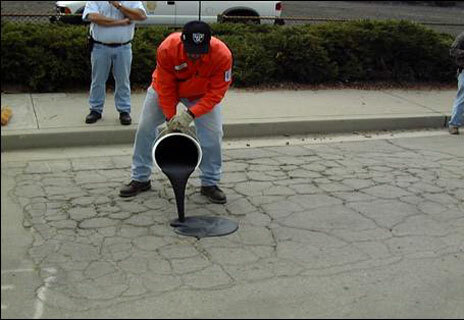 1207 PERCOL GeoFlo Rapid Asphalt Repair Slurry is supplied in five gallon kits for reconstruction of deteriorated asphalt with NO ASPHALT REMOVAL Suitable for narrow or wide cracks, alligatoring, and small pot-holes. Repairs support load, restore aggregate interlock, improve ride, and blend in visually with surrounding pavement. A thin coat fuels and water proofs asphalt. Percol GeoFlo Asphalt Repair Kit Includes Everything You Need To Complete Your Asphalt Repair! Use for an anti-skid and wearing surface by topping the repair (while wet and before set up of polymer or slurry) with Anti Skid. Mix your materials and apply as you would with our standard process. Use topping sand generously on the GeoFlo Asphalt Slurry, Alligator Glue, Asphalt Welder & Elastic Cement AC with Black Diamond Sand. When the material has set up, sweep off access sand and your asphalt repair is ready. We recommend that you use our specially-coated black diamond sand because it bonds better to our products than other sands. Available in 12 or 25 pound bags. Note: These two video demos are for GeoFlo Asphalt Repair Slurry, and/or GeoSet Concrete Repair Slurry. The mixing procedures are the same for both GeoFlo and GeoSet.